I always feel a little sorry for Thanksgiving. When I walked in to Starbucks this afternoon (my mobile office on Tuesdays and Thursdays)–I was bombarded by Christmas. What happened to Thanksgiving? It seems like the moment we turn the page on Halloween, Christmas gets permission to take over the retail world. And while my family may be guilty of a few Christmas songs over dinner last night, I LOVE Thanksgiving and I like to give her her moment in the spotlight. Several weeks ago, I was asked by the lovely, Sheri, to be one of several bloggers to preview and play around with a brand new site from CafeMom called The Prowl. It’s a place to gather and curate all kinds of lovely finds, grouped together into boards–much like Pinterest. But what I love about Prowl, is the community aspect that isn’t present on Pinterest. Users can ask and answer questions. For example–before I headed to SanFrancisco, I asked for some suggestions of “statement” necklaces that would go well with a chambray shirt I was planning to wear. Boom. I got awesome suggestions from other users on The Prowl. For Christmas this year, I want to get everyone in the family a funny mug. I asked on The Prowl and got bombarded with ideas–some great, some not so much (I’m talking to you, “tooting” travel mug.). 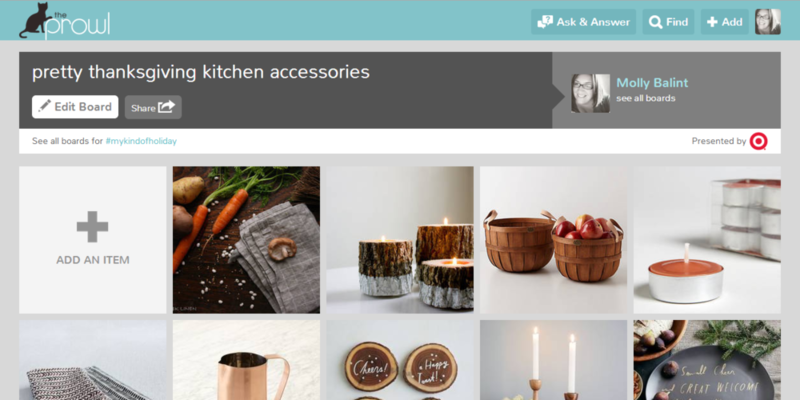 It’s a place to gather and curate all kinds of lovely finds, grouped together into boards–much like Pinterest. But what I love about The Prowl, is the community aspect that isn’t present on Pinterest. Users can ask and answer questions. It’s a combination of your girlfriends sitting on your bed helping you pick outfits that look good on you and those people on the internet who always seem to find the best stuff–all rolled into one. Back to Thanksgiving….this past week, I’ve joined up with The Prowl and Target to create a board of some of my favorite pretty Thanksgiving kitchen accessories and you can check them all out here. It’s been tons of fun curate my own favorites for one of my favorite times of the year. So if you haven’t checked out The Prowl, go poke around, ask a few questions, check out the questions I’ve asked, and make sure you find me!